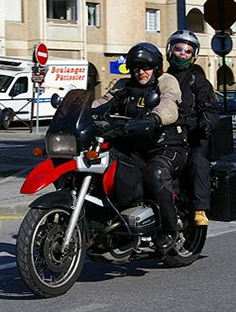 Their clients have confirmed that early legal advice was imperative with their service dedicated to the needs of motorcyclists. 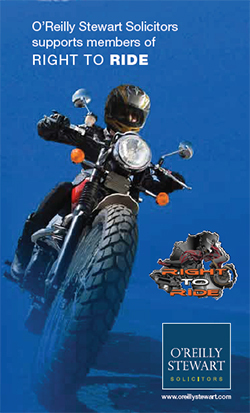 ‘Right to Ride’ has highlighted the issues faced by riders on our roads and the lack of awareness or understanding of how best to record the accident details, or what, if any, information is required from the scene. Thus O’Reilly Stewart have updated their information leaflet that gives a short summary of the details you should record at the scene of the accident. The leaflet still comes with the “Rider Record” which is a credit sized card, with sections to record initial information about the other vehicle, accident circumstances, weather, witnesses and road conditions at the scene of an accident. We recommend that you contact them if involved in an accident. Part of what we do at Right to Ride is involvement in motorcycle road safety, looking at facts and figures and reporting on these. The commitment of O’Reilly Stewart will greatly assist us in continuing this involvement and representation on road safety forums. 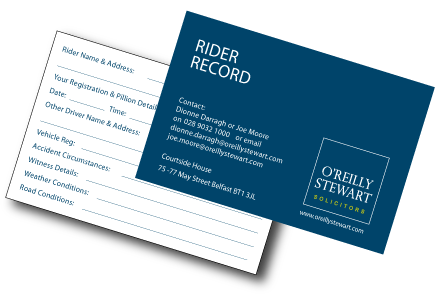 You can download the leaflet and Rider Record card on this page.